International Journal of Physiology, Nutrition and Physical Education is a Peer Reviewed/Refereed Journal. Prime Focus of the Journal is to publish articles related to the current trends of research. This Journal provides platform with the aim of motivating students and personnel in Sports and Physical Education. International Journal of Physiology, Nutrition and Physical Education considers review and research articles related to: Adapted Physical Activity, Aerobic Exercise, Biophysical Investigation of Sports Performance, Combat Sports and Martial Arts, Design of sports Devices, Fitness-Tools Manufacturing Researches, Exercise Physiology, Games, Health Education, Individual Sports, Kinanthropometry, Kinesiology, Kinesiology, Market trends in sports, Military sports, Movement Science, Nutrition in Sports and Exercise, Philosophy of Sport, Physical Education, Physical Exercise and Health, Physical Fitness, Physiotherapy, Political Science of Sport, Sports Facilities, Sports History, Sports Information, Sports Medicine, Sports Therapy, Sports Injuries and Prevention (Spinal Injuries and Deformities, Rehabilitation, Arthoplasty, Arthritis, Autoimmune Connective Tissue Diseases & Disorders, Cartilage Regeneration, Musculoskeletal Physiotherapy, Injury Management, Foot & Ankle Disorders, Neuromotor Psychology, Neurorehabilitation Techniques, Orthopedics and Osteopathy, Muscle Hypertrophy), Sports Management, Sports Pedagogy, Sports Biomechanics, Sports Business & Sports Development, Sports in public/private sector, Sports Law, Sports Management, Sports Nutrition, Sports Psychology, Sports Science, Sports Sociology, Sports Statistics, Sports Tourism, Sports Training, Strength and Conditioning, Stress Management, Training and Judgements, Trekking & Bouldering, and Meditation & Yogic Psychology. Your views and comments will be highly acclaimed. Author can send their articles to info@journalofsports.com. All manuscripts are subjected to RAPID peer review process and those of high quality (which are not previously published and are not under consideration for publication by another journal) would be published without any delay in subsequent issues. Online submission of the manuscript is strongly recommended. A manuscript number will be mailed to the corresponding author within one week or earlier. 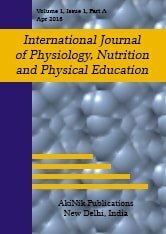 On the behalf of International Journal of Physiology, Nutrition and Physical Education, I would like to extend my regards to all fellow researchers and scholars and wish them prosperity in their field.